luminous in my chaotic dreams(life): Going Forward…Looking Back! Good morning, hope all is well with you! We are back and ready to show you some sassiness! 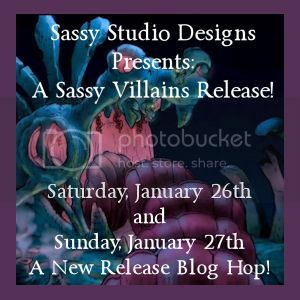 We are doing more Disney Villains with a Lindsay spin on them! As you can see it is a 2 day hop. We split the team in half and each one did one day this weekend. We thought it might make it easier on you. And give you plenty of time to hop along! You should have arrived here from the SSD blog, and when you leave you will be visiting the very talented Starla. Ok, so here are some rules for you. You need to visit each person for that day and leave comments along the way. Make sure you visit the SSD blog as well. 2 Randomly selected people will win 2 of the the new images, and 1 randomly selected person will win all 4! Now, remember this is for each day, so make sure you do both hops for double the chance to win. Since it’s the start of the new year, Kim thought we should not only move forward, but take a look back at our favorite SSD creation from last year. So, for my new part I used the new Maleficent Sassy. I just love the colors and the lace and all of the flowers! Thank you so much for stopping by and have a wonderful day! From here you should be visiting Starla. These are both beautiful cards. I love the embellishments. Sara, this is great. The flowers and he purples are perfect. Gorgeous Valentine creation Sara, love the purples and flowers. Your "old" card is a stunner, too. Such a fab color combo. She's a beauty & you did a wonderful job coloring her! Your Marie Antionette card is equally gorgeous! Both of these cards are fabulous! Awesome creations! Maleficent never looked so good! :-) Great job! Maleficent is fabulous! I love the colors and the papers are gorgeous. And I adore the Marie Antoinette card! Great colors and I so love the lace. First I have to tell you that your new blog design is YUM! Really love the change! Sara, Maleficent is simply stunning!! Love everything, from your papers to your flowers and gorgeous coloring!! Stunning creation as well with Maire Antoniette, love your colors, absolutley beautiful design with your lace and flowers! Gorgeous Creation! I LOVE the Flowers & how you colored her!! Great Card from the past too!! HUGS! Sara, this is so beautiful! I love your coloring and those flowers you added. Really beautiful Sara...both of them. I really love the purple. Love the cards Sara. Have to agree with you on copics - a fave of mine too. Absolutely gorgeous! Your coloring is superb, and I love the layout of your Marie Antoinette card! Awesome cards Sara, I love the flowers and design of your card and your throwback card is absolutely Stunning. Very pretty cards. Love the coloring and pattern paper matching. Super Fab creations Sara. Great Job. Beautiful, Sara! Love the flowers and your gorgeous pick from 2012! Love the layout here and the purple antiquey looking roses! Gorgeous!